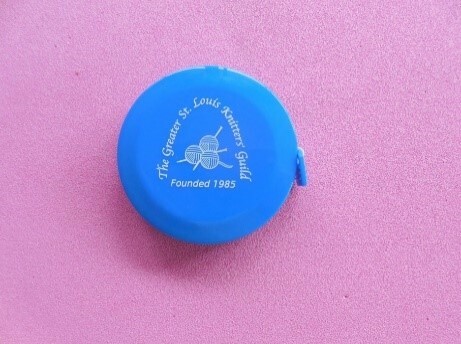 Measuring tapes with guild logo are available for $3 each. or contact President or Treasurer for alternate arrangement. ORDER DIRECT FROM LANDS’ END! Order your GSLKG Guild tote bags, shirts or other items directly from Lands’ End! Please visit our new Greater St. Louis Knitters’ Guild Lands’ End company store! You can order Lands’ End items with our guild logo and add your personalization, if desired (name/initials or nickname/phrase), then have them delivered straight to your door! You can use your credit card, order what you want online, and no sending checks to the treasurer! No waiting until the guild meeting to get your order! Do not login, just click on the “shop your store” link, pick your item (our logo will fit on shirts, jackets, tote bags, or bags! ), start the process, and you’ll have your order before you know it! Sign up for Lands’ End Business Outfitters E-mail Offers – they often offer free shipping! If you want your bag or shirt personalized with a name/initials or a phrase – be sure you include special instructions in the shopping cart before submitting your order. There are four colorway versions of our logo: one for light clothing, one for dark clothing, one for light totes/bags and another for dark totes/bags. The dark logo versions show up better on dark items. Don’t forget – we recommend protecting light-colored totes with a stain repellant once you receive it to keep it looking great!